 A practical, thoroughly sensible approach to weight control written with authority and insight. Both authors have long personal experience with weight problems and eating disorders, and psychologist Epstein was a counselor at a diet center. First they expose the high-pressure marketing techniques of commercial weight-loss programs, showing why these programs fail and their potential harm to clients' health. 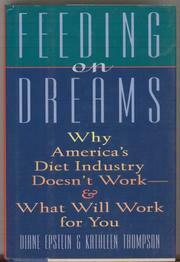 Epstein and Thompson examine four types of programs: liquid-fast (e.g., Optifast, Medifast), food-inclusive (e.g., Jenny Craig, Weight Watchers), structured menu (e.g., Diet Center, Physicians' Weight Loss Centers), and support groups (e.g., Overeaters Anonymous). They assert that, besides often being expensive, these programs are unrealistically rigid, their support services virtually nonexistent, and the counselors unqualified. The alternative they recommend is to design one's own program, based on three principles: (1) taking control, (2) accepting food as a pleasure, and (3) trusting one's own body. The mechanics of weight control are explained briefly and simply, but the main focus is on teaching the skills needed to set up and follow a personal program. Each of the six skill chapters contains questionnaires for assessing one's present status and a list of practical suggestions. Many of these are clearly aimed at women (e.g., ``Get rid of all your fashion magazines''), a bias the authors acknowledge in their introduction. There's a final section for those with serious problems, such as anorexia nervosa, bulimia, and compulsive eating, and there's a special chapter for men that ends with Satchel Paige's famous dicta for healthy living, including, ``Keep the juices flowing by jangling around gently as you move.'' An appendix lists helpful books and organizations. Revealing, realistic, and refreshingly jargon-free.